For your convenience, we have blocked rooms in the hotels Hilton Garden Inn Corvallis and Courtyard Corvallis. Please make your own reservations by following the designated links provided with each of these hotels. A limited number of on-campus budget housing ($65/night) is available. Use the Conference Registration site to make your reservations. Serving as the headquarter hotel to Oregon State University, Hilton Garden Inn Corvallis is conveniently located next to The LaSells Stewart Center and the conference venue. It offers 153 guests rooms and provides a standard of comfort and service that is renowned with their name. The Hilton Garden Inn would like to offer a special rate for guest lodging (rates range from $132 per night + tax). Please make your room reservation by July 1st to ensure the group rate and room availability. Deadline to reserve: July 16th or until the group block is sold-out, whichever comes first. 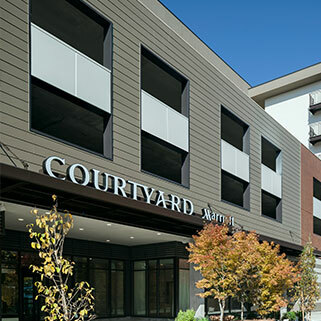 Serving our conference, it is a new hotel in the heart of the Corvallis historic district, Courtyard Corvallis offers a modern setting surrounded by local shops and eateries. Guests can stroll down to the Willamette Riverfront and Downtown areas. This hotel is located off campus in Corvallis downtown and is an easy walk to the conference venue. At Holiday Inn Express, guests will enjoy scenic views of the Willamette River from the comfort of their room and it is located minutes from Oregon State University. It offers 98 guests rooms. The Holiday Inn Express would like to a special rate for guest lodging. This hotel is located off campus, but with easy access to downtown and may provide shuttle to the campus. Use the Conference Registration site to make your reservations. The Residential Conferences staff at Oregon State University invites your group to stay with us. We provide on-campus housing accommodations (hotel style) at a convenient budget price ($65/night).